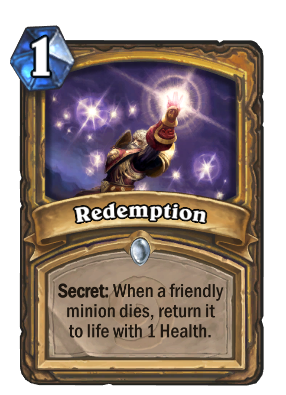 Secret: When a friendly minion dies, return it to life with 1 Health. I am not sure how you get demptioned the first time. It’s a mystery! If a card is boosted in hand by Smugglers Run and such, will it retain the damage buff? As a note this removes any buffs or de-buffs off the card. This includes silences and things like blessing of kings. Death-Rattles will also trigger when the unit dies and the re-summoned unit with one life will also be re-able to trigger the Death-Rattle when it dies again (or if a hunter is able to get the secret (through the use of the card that steals secrets) when feign death is used). What happens if many minions die at the same time? The first Minion to be summoned out of that group becomes the target. Turn 3 I drop a 3/2 and Redemption. and my opponent then uses a board clear that does 2+ damage. Been having a ton of luck with this card in my variation of the shockadin. Not only does it tend to catch people off guard since Noble Sacrifice tends to be the go-to secret for aggro, but it synergizes very well any minion with a divine shield and knife jugglers. Can also use it with Loot Hoarder in a pinch to get extra cards in those games where you have a bad hand. just wondering about if a minion has a divine shield (like scarlet crusader) and dies does it still have divine shield when it comes back? It will have divine shield when it comes back, yes.